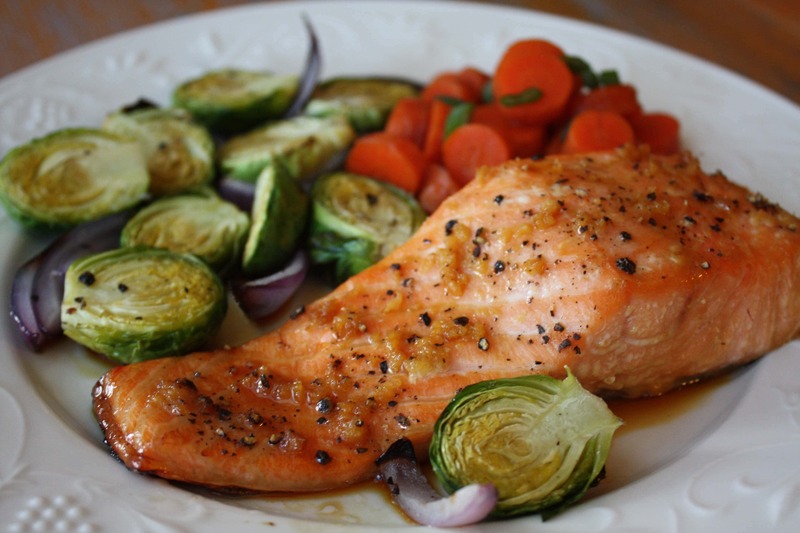 This recipe for Ginger Birch Baked Salmon has a fun story. Always looking for flavors unique to a destination, I was fascinated to find that there was a sort of rivalry between the East and West Coast regarding … syrup. Yes, I said syrup. I bet you know all about maple syrup and maybe recently drizzled it on pancakes or oatmeal. But have you heard of it’s distant cousin, birch syrup? While maple syrup is the sweet product of North Eastern states such as Vermont and Maine, birch syrup is harvested from birch trees in Alaska and the Yukon territories. I first experienced birch syrup in Vancouver while shopping at the Granville Island Public Market. This maple impostor intrigued me. I sampled a small taste from a spoon and its tangy and subtly sweet flavor had me hooked. I bought a couple of bottles as souvenirs to cook with at home and found that it’s a great fish marinade. If you happen to be traveling in the Northwest of the USA or Canada, pick up a bottle! Here’s a recipe to test it out. 1. Combine 3 tsp birch syrup, ginger, salt and pepper in a shallow bowl. Add fish to marinade and turn to coat thoroughly. Cover and refrigerate to marinate for a minimum of two hours or let it marinate overnight. 2. Place salmon steaks in an oven safe pan, skin side down, coat with remaining 1 tsp birch syrup and bake for 20 minutes at 350 F. I find it helpful to line the pan with tinfoil for easy serving and cleanup. 3. Serve with your choice of vegetables. I have the recipe in the notes for birch syrup glazed carrots below. Try it BBQ’d! Barbecue on a hot grill for 20 – 45 minutes depending on the thickness of the fish. Mix birch syrup and orange juice in a small mixing bowl. Pour over cooked and drained carrots. Sprinkle with ginger, if desired. 1. Combine 3 tsp birch syrup, ginger, salt and pepper in a shallow bowl. Add fish to marinade and turn to coat thoroughly. Cover and refrigerate for a minimum of two hours or let it marinate overnight. 3. Serve with your choice of vegetables. I have the recipe for birch syrup glazed carrots below. Tip: Try it BBQ’d! Barbecue on a hot grill for 20 – 45 minutes depending on the thickness of the fish.